If you live in a climate and location where you see other palm trees growing, you can successfully plant and grow a palm in your own landscape. 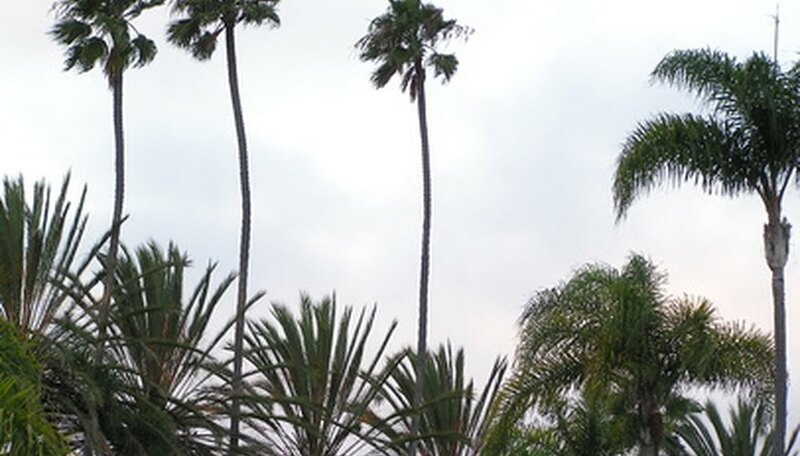 A wide variety of palms are available to choose from to create a tropical look in your yard. Palms are easy to maintain if you take care when you initially transplant them into your yard. Look around your neighborhood at the types of palm trees that are established and growing. This will be a good indication of the type of palm tree suited to your environment. Not every palm variety can grow and thrive in any one area. Choosing a native palm tree for your landscape will help in combating diseases, as native palms are less susceptible and stronger. To have your newly planted palm tree grow successfully you will need to select a variety that enjoys your climate. Select an area in your landscape for your palm tree. You have already decided on the variety of palm you want to plant; now select a spot that will be conducive to its growing needs. Does your variety need full sun or partial shade? What soil type is best? These are a few questions you must answer in selecting the spot in your yard for your palm. You also must consider the area and the impact your palm will have years from now. Are there wires or anything else above where you plan to plant your palm? Any buried lines, including irrigation systems? Your palm may grow very large in the years to come. Dig a hole twice as wide as the root ball of your palm, but only as deep as your palm was originally planted. Planting your palm too deep will inhibit its growth. Your palm should be planted only to its original depth. Use a hose to water the root ball of your palm as you plant it. Consistent and even moisture for your palm's root system is essential for the first three or four months. After filling the hole around your palm with the soil you dug out, build a barrier with soil around your palm tree, about five or six inches out and three or four inches deep. Fill this trough with water when you water your palm to ensure the roots receive enough moisture. Put three or four inches of mulch around your palm tree base, on the outside of the water trough you built. The mulch will help add rich organic material to the soil around your palm and feed the roots; plus the mulch helps keep the soil moist. Fertilize your palm tree every four months with a slow release granular fertilizer with a 3-1-3 (nitrogen, phosphorus, potassium) ratio, or use a commercially formulated fertilizer for palm trees.